I have to admit I have had this same frustration of tying small flies on the stream many times. Hank's advice is pretty sound. It's crazy how one word can have so many different meanings when it comes to fishing. Tonight I was listending to Under Pressure by Queen. Then I thought about how barometric pressure affects fishing. After that I thought about fishing pressure and how that affects things. Then last I was pondering how much pressure you put on your line can effect whether you land a fish or not. A string of bad luck has made me yearn for a trip to the mountains in the worst way. I recently was in an accident and my car was in the shop. I bought a new used car yesterday and I figured what better way to test it out than a long drive. I woke up early and gathered my things. I had asked friends to come along but no one was game. I was disappointed but happy at the same time. Going solo you don't have to worry about others agendas. The morning had a nice chill to it and there was a fog that lingered just a few feet off the ground. It would clear as I went up a hill only to devour my car again as I went into a valley. I listened intently for anything strange going on with the car. Finally I decided to relax and let the powers at be take over. I haven't had a working CD player in years. It was a blessing and nice company on the ride up. When I hit the stream there were no other cars in site. Strange, because it was no secret the delayed harvest streams were recently stocked. I rigged up my gear quickly thinking cars would be surrounding me any time. I choked down a granola bar and water then secured the car and prepared to venture off. Still no cars were seen. I moved down to a spot that was good in the spring and surveyed the water for awhile. I couldn't see anything at first. It always takes me awhile to get my trout vision back. I actually didn't see any fish until I made my first cast and saw several silhouettes move beneath the surface. Yep, the fish were there. They weren't really feeling safe yet. They were following my white wooly bugger but never trying to hit the fly. I switched up with a bead headed soft hackle and a hares ear. About my third cast I saw my indicator move. I don't know how many strikes I missed. I'm not exaggerating when I say 20 before I caught my first fish. I was really rusty and the first fish I had on shook themselves loose. To make it worse I didn't bring a net. It has been awhile since I've landed a fish merely by just using my hand. Especially fish 12-13inches. 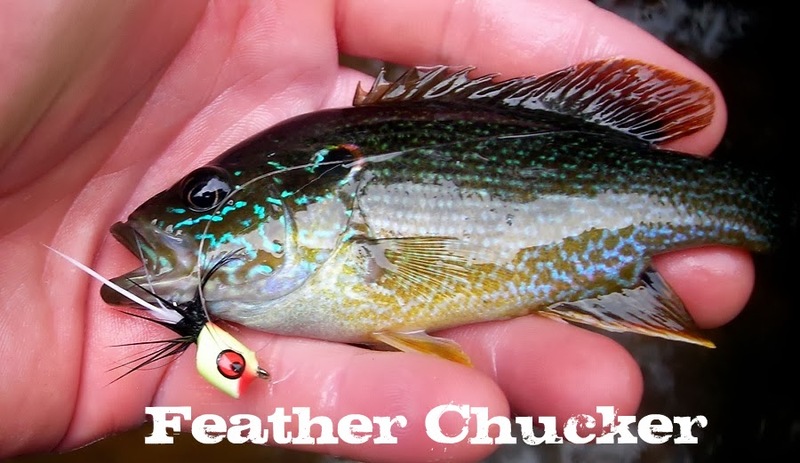 A couple of times the fish would take the above fly and while trying to unhook it the fish would slip take off and embed the dropper in my hand. I just kept thinking I wish I had my net. Even with several hook punctures, missed strikes and short distance releases I was having a blast. I still hadn't seen another fisherman. Then after about an hour one shows up. I hook a fish almost exactly as the person asks how I'm doing. It was obvious how we were all going to do today. The fish were here and if you had any previous experience at all you were going to catch them. I moved down methodically and worked water slowly. I decided to switch it up and try a san juan worm and a bead head soft hackle. I know this run pretty well and it always holds fish. A few casts upstream and working the currents yielded nothing. Then on the swing right before I lifted the rod to recast, my indicator goes under. I lift the rod smoothly thinking maybe it's another leaf. The rod bobs and bows hard. This is no leaf. Further confirmed by a flash shooting up stream and pealing off line. The fish was big and at first I thought I for sure hooked a carp or large sucker fish. Then the fish launched out of the water and showed its burgundy stripe. A monster rainbow. One of the biggest I had ever hooked. The fish ran all over the pool and I had to pressure the fish with all my rod had to keep it from going down stream and over a spillway. It probably took 5min to land the fish but it seemed like half an hour. I wish I brought my net. I finally got the fish in hand and got a good view of the beast. I'll still take it. Watching a fish this size jump was amazing and the power gives you a real appreciation for catching a fish this big. The day went on and I caught fish in almost all the places I expected them to be. The weather and scenery couldn't have been better. The trees were showing some color and giving glimpses of what's to come. If the wind blew just right you would walk through a curtain of leaves. It's something that can't really be explained but everyone should experience at least once. 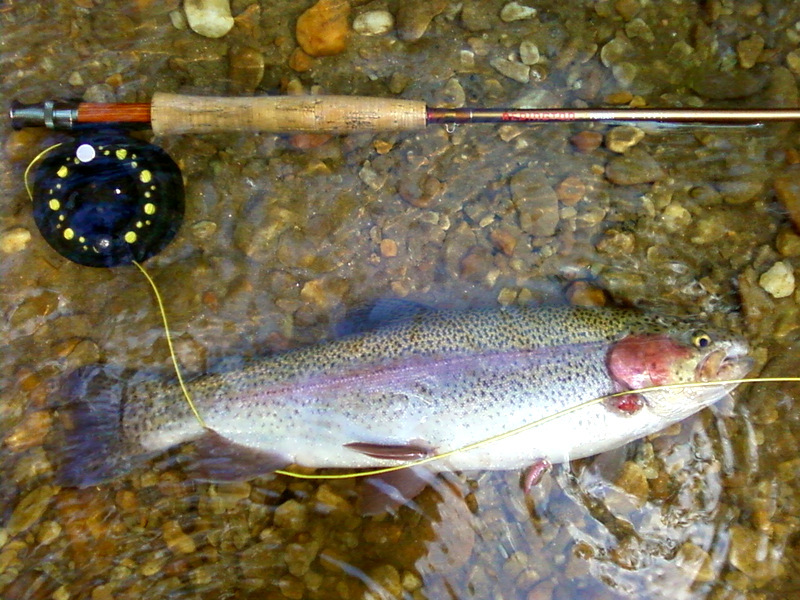 I probably only landed about 5 fish and had too many long and short distance releases to count. I realized I'm not that great of a fisherman. I just know where to go and what to use. Even with that knowledge I have to hook the fish just right and be on my game. This day definitely wasn't one of my best fishing days but I'll take it. There's something a lot of fisherman know about but don't really share with each other. At least not until there is discussion about fly fishing apparel. This secret isn't about shirts, pants or nifty wading boots. It's actually about underwear. You see in NC in the summer it gets really hot and humid. There's nothing worse than never really feeling like you ever get dry. Also after a few days camping if you don't have the right clothing your pants or shorts can get a serious smell of crotch rot. Luckily there's a cure for this. ExOfficio has a pair of boxers that breathe and dry super quickly. More importantly they reduce odor. The boxers are super comfortable and easy to wash. I'd say they are a must have if you do any fishing trips where you're in a boat or wading for an extended period of time. I wear them pretty much whenever I go fishing now. You'll find too many of your fishing friends already use these and figure you either know about them or they are too embarrassed to bring it up. Give these undies a try you won't be sorry.